One sample observation (AOR) was selected for each of the nine brightest IRAC calibration�stars (Reach et al. 2005, ). The selected AORs were from 2005 June 05 to 2006 September. Photometry was performed on the five BCDs in each AOR and the results averaged. (C)BCD�uncertainties and imasks were used. The pipeline�versions were S14.0-S14.4. The central PRF, modified for APEX�use as described above, was used as the stars were close to the center of the array in each of the images. APEX_1frame was used with current default parameters in the namelists provided in the cdf/ sub-directory of the MOPEX distribution, e.g., apex_1frame_I1.nl etc, with one change. A Normalization Radius for the PRF is needed to correspond to the IRAC calibration�radius of 10 pixels. This was placed in the parameter block for sourcestimate: Normalization_Radius = 1000 (since it is in units�of PRF pixels, and the sampling is 100x). 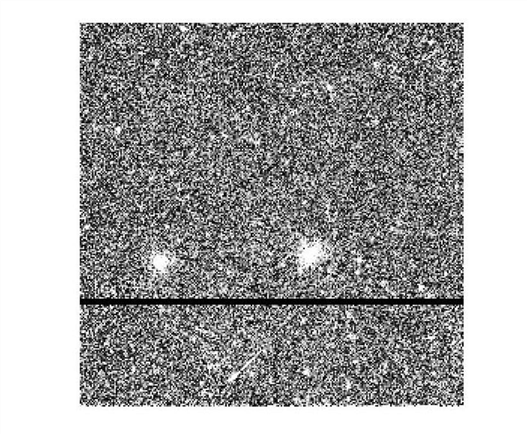 where p is the radial pixel phase, defined as the distance of the centroid of the stellar image from the center of its peak pixel. This corrects to an average pixel phase of �pix. The average PRF-fitted fluxes compared to aperture photometry�are shown in Figure C.1. The weighted average differences between PRF fluxes and (corrected) aperture fluxes are shown as long blue dashes. There are offsets in all four channels between the aperture and fitted fluxes. In IRAC channels 3 and 4, the offset is due to the fact that in these channels, the PSFs are wide and there is significant flux in the 12�20 pixel background�annulus subtracted out in the IRAC calibration. APEX�does not know about this in its PRF normalization, so the PRF fluxes are too high. We examined the "core" PRFs and estimated this factor. The estimated effect of the annulus on the PRF fluxes is shown in Fig. C.1 as black, short dashes. These are within 1% of the IRAC channel�3 and 4 estimates from the calibration stars. For IRAC channels 1 and 2, these annulus terms appear to be small, so we assume zero correction for the present time. The annulus correction factors (divide PRF fluxes by these) are 1.022 for IRAC channel�3, and 1.014 for IRAC channel�4 (Table C.1). The offset for IRAC channel�1 in Figure C.1 is due to a completely different effect, namely the pixel phase effect described above. Aperture sums on the channel�1 IRAC PRFs match reasonably well the pixel phase relation in Eqn. C.1 if we sum a 10 pixel radius aperture. APEX�performs normalization on the ''center-of-pixel'' (pixel phase [0,0]) PRF, and applies this normalization factor to all sub-pixel positions. This results in an offset of the photometry relative to the mean pixel phase of . We need to ''back out'' APEX's center normalization. Setting p=0 in Eqn. C.1 gives us the required factor: divide the PRF fluxes by 1.021. Similarly, using the pixel phase slope of 0.0301 in IRAC channel�2 leads to a correction factor of 1.012. With these corrections, the PRF fitting on single CBCDs matches aperture results with any systematics less than a percent in all IRAC channels (Fig. C.2). The remaining scatter is most likely due to residual pixel phase effect not removed by the one-dimensional correction applied to the aperture photometry. The true pixel phase effect has two dimensional structure which is included in the PRF (see also Mighell et al. 2008, ). Divide PRF fluxes by the last column. 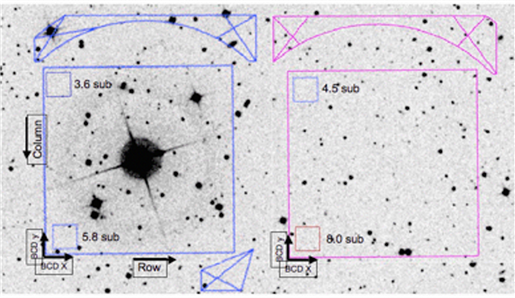 Figure C.1: PRF fits vs. aperture photometry�for selected IRAC calibration�star CBCDs. The vertical axis is the fractional difference between the PRF fit and corrected aperture photometry. The aperture photometry for IRAC channels 3 and 4 is in a 3 pixel radius with a 12�20 pixel background�annulus and an aperture correction�factor from this Handbook. For IRAC channels 1 and 2, it is in a 10 pixel radius with the same annulus. Short black dashed lines are the expected annulus correction needed. Long blue dashed line is the offset estimated from a weighted average of the data. Note this is essentially the expected value for IRAC channels 3 and 4. But IRAC channel�1 (and IRAC channel�2 to a lesser extent) requires a pixel-phase correction (see text). Figure C.2: Data from Fig. C.1, with IRAC channels 3 and 4 corrected for the annulus contribution, and IRAC channels 1 and 2 corrected for the pixel-phase effect. Data for this test is a ''C2D'' off-cloud field (OC3) near Serpens, AORKEY�5714944 (S14.0). The observation is HDR�mode data (0.6 and 12 sec) from all four IRAC channels. The observation used two repeats of two dithers, so the typical coverage is 4. The observation consisted of a 3x4 map. The field was chosen to be a crowded, predominantly stellar, field. The BCD�data were run through artifact�mitigation to correct muxbleed, column pulldown/pullup, electronic banding�and the first frame effect. No pixel replacement was done. Long and short HDR data were handled separately. The tests here are with the long frames. APEX�multiframe was used with the Hoffmann PRFs, using a complete set of 25 array-location-dependent PRFs. Note that APEX does aperture photometry�on the mosaic, but PRF fits on the stack (individual images). Final extracted sources shown are those with SNR > ~ 8. Figure C.3 shows the comparison of PRF-fitted fluxes to aperture-corrected aperture photometry�in a 3 pixel radius aperture. For IRAC channels 1 and 2, this is without pixel-phase corrections; for IRAC channels 3 and 4 it is with correction for the PRF aperture (Table C.1), but without correction for mosaic smear. Mosaicking involves an interpolation process which smears out point sources. Aperture corrections for aperture photometry off the mosaics�need therefore to be made either based on point sources in the mosaic itself, or using values for CBCDs with a correction for mosaic smear. The amount of smearing depends on the pixel sampling in the final mosaic. Figure C.3: APEX�PRF-fitted photometry in the Serpens test field, with array-location-dependent PRFs vs. aperture photometry. The aperture has a 3 pixel radius, the background�annulus is 12�20 pixels. The aperture fluxes have been corrected using the aperture corrections in this Handbook. The IRAC channel�3 and 4 PRF fluxes have been corrected for annulus contribution. Figure C.4 shows the data with the remaining corrections discussed above applied. PRF fluxes for IRAC channels 1 and 2 were corrected for the pixel phase effect (Table C.1). Mosaic smear corrections for the aperture fluxes were determined empirically by comparing BCD�and mosaic aperture fluxes. In IRAC channels 1 and 2 they were negligible, but IRAC channel�3 and 4 fluxes were corrected by 2.8% and 1.5%, respectively. The results (Fig. C.4) show generally good agreement with aperture photometry, with any systematic offset < 1%. Figure C.4: APEX�PRF-fitted photometry with a PRF Map vs. aperture photometry�in the Serpens test field. PRF and aperture fluxes have been corrected as described in the text.